The murky world of the far right has always had the upper infrastructure with the links they want people to know about and the underground infrastucture with the ‘dirty’ links, the links between the political wannabes and the thugs, racists and downright fascists that they so desperately want to keep hidden from the voting public. Anne Marie Waters of ‘For Britain’, busy putting the finishing touches to her bid to the Parliamentary seat for Lewisham East, is no exception to this rule. Associates that she believes will give her credibility (including the hapless convicted criminal Yaxley Lennon) she openly hawks around during her political campaigning. But many members of her group she is more coy about and certainly she is more circumspect in relation to some of the external links her close members have. 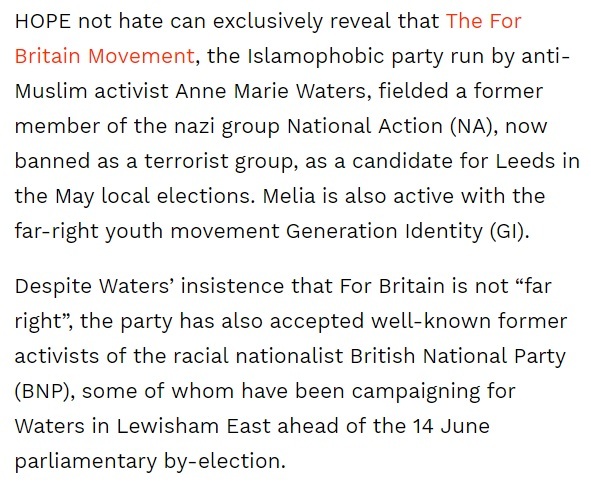 Last week respected anti hate group Hope not Hate published an article about Anne Marie’s links with National Action. 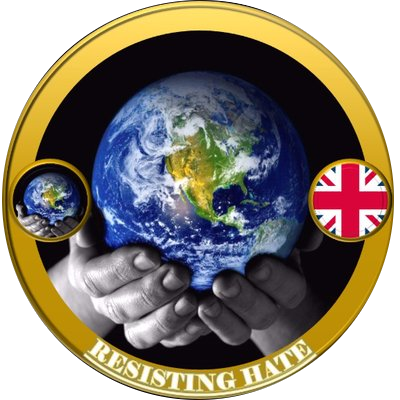 The reporting restrictions on National Action were lifted today and the press have openly reported that members of NA are on trial for a plot to murder Labour MP Rosie Cooper. It is important to note that NA members are not being tried for being a hate group in the rowdy street protest, empty threats, sense of the term. This is a group who allegedly formed a tangible plan to commit the act of murder. This is a group on trial for allegedly acquiring a weapon with purpose and intent to kill. 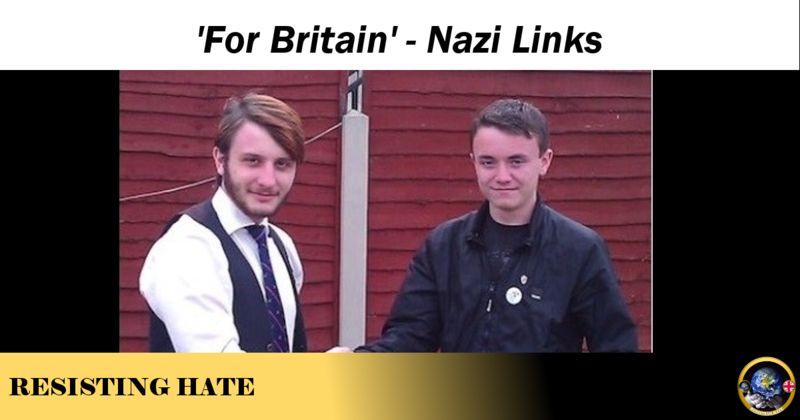 Anne Marie Waters has welcomed a member of this Nazi group into ‘For Britain’. But the links between For Britain and National Action appear to go even deeper than a cross over of members. 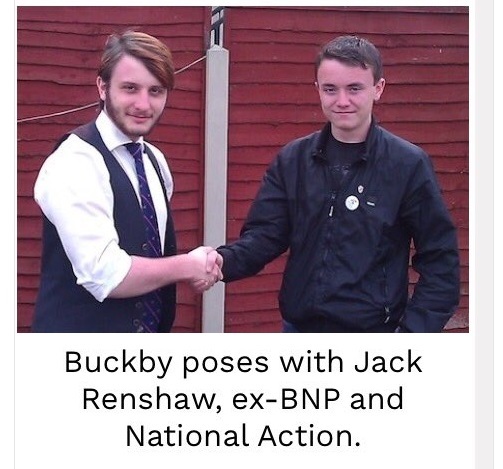 It would appear that ex BNP Jack Buckby (who Hope not Hate confirm as being a “key influence” in the founding of For Britain) has a personal acquaintance with Jack Renshaw of NA notoriety. (Renshaw has been under a reporting ban for a significant period of time but it has been publicly reported today that Renshaw was the individual who allegedly intended to carry out the killing of Rosie Cooper). And here is Jack Buckby shaking hands for a photo op with Jack Renshaw. And he acknowledges he knew Renshaw personally. I knew the guy who can't be named for legal reasons, when he was much younger. Tried to stop him going down this route. Failed. Yep, that's me, and that's him, before he ever joined National Action. And before he ever exhibited any anti-semitic behaviour. I mean, look at the state of me, and my hair. Is it not obvious that this was a LONG time ago before National Action even existed? And before Jack Renshaw joined Neo Nazi groups? 1) I only joined the party after it accepted non-white members. 2) I came up against the holocaust deniers in the party. One of the reasons I left. 3) I support the death penalty. I have never been a fascist. I support capitalism, proportional representation, direct democracy. Chris…that photo was taken before NA even existed, and before that young kid had exhibited any anti-Semitic behaviour. I knew him before he went mental – and tried to stop him going down that path. So did she know when she formed For Britain that ex BNP Jack Buckby had links with NA? Is he the channel through which Anne Marie has been getting her NA members to support For Britain? 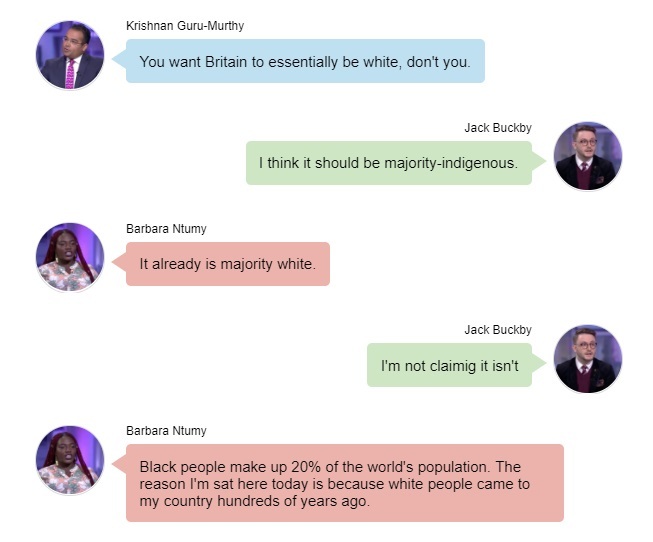 Just how involved with NA is Jack Buckby? He claims his association is in the past but seeing as For Britain were only exposed last week for having an NA member in their group can we believe he is telling the truth? She must have known he held racist beliefs (source article here). She must have known the views people had about him. So what made Anne Marie decide this man was suitable to join the party that she regularly insists isn;t far right and isn’t all about hate? And more importantly – what impact will Buckby’s ties to NA have on the good people of Lewisham East when they go to the polls on Thursday? 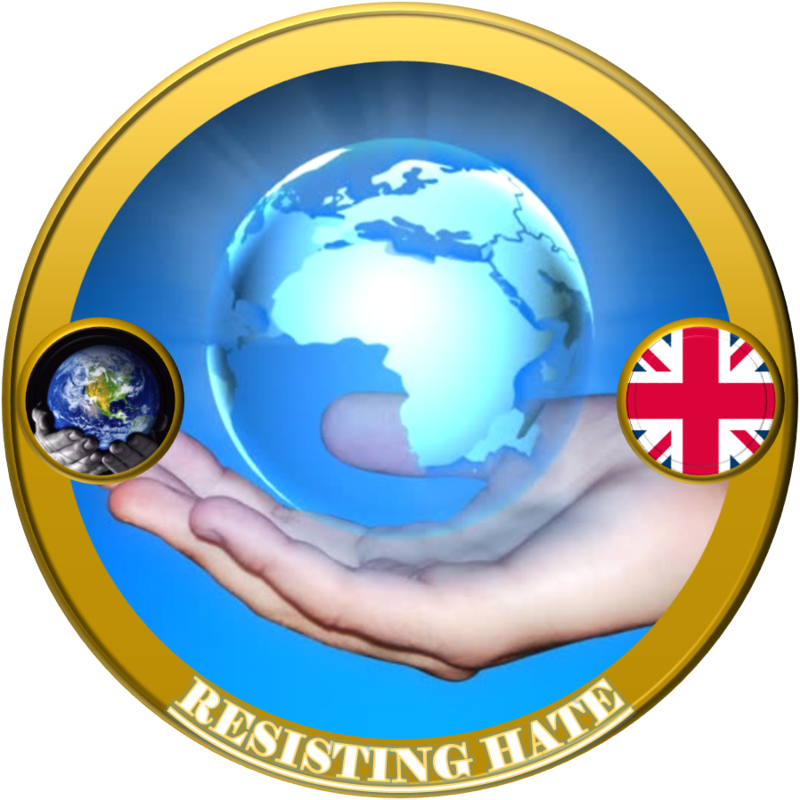 Vote for For Britain with their open Islamophobia and links to an undercurrent of antisemitic violence? Not a chance in hell of For Britain getting that seat!